Walking through Amsterdam these days, you’d be forgiven for thinking that the city is being taken over by gourmet hamburger bars. There is indeed a wealth of eateries serving up different takes on the handheld classic, and choosing one can be a challenge. But have no fear Faraz, we’re on hand to sort the best from the rest. 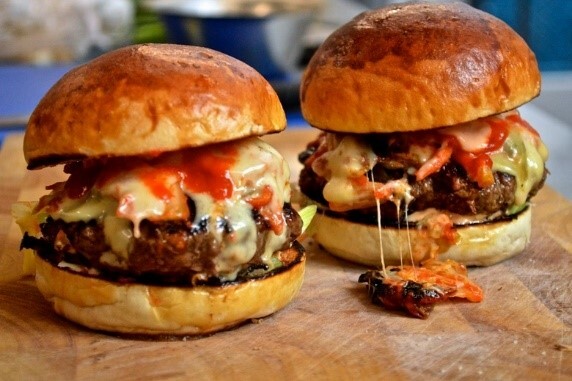 Here’s our list of the top five hamburgers in Amsterdam. 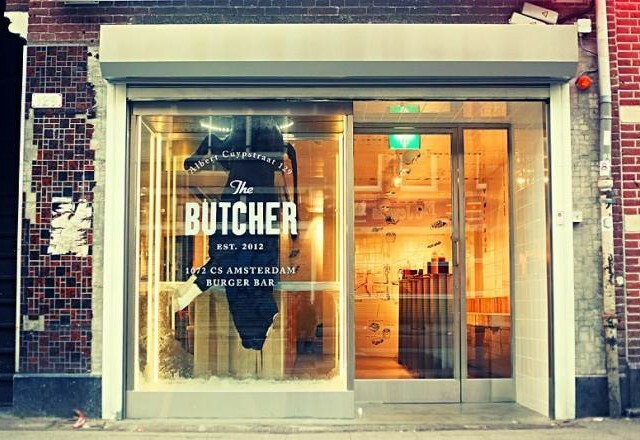 With five Amsterdam locations including a restaurant/bar/nightclub “social club,” as well as branches in Berlin and Ibiza, The Butcher is as painfully hip as they come. It’s also bloody delicious. Wait times can be long and seating scarce at certain times and some locations, but it’s totally worth it. The meat is succulent and cooked as bloody or burnt as you like it, and the sweet potato fries are the perfect accompaniment. Among the staples, The Butcher’s menu offers some novel options. Try the “Silence of the Lamb” – made with prime New Zealand lamb and a selection of spices, or “The Ugly” – an Aberdeen Angus burger shoved into a wrap with avocado, jalapeño, sour cream & BBQ sauce. Perhaps unsurprisingly, meat takes center stage at Cannibale Royale. As well as burgers, Cannibale serves up thick, juicy steaks and sticky ribs, all from four locations in Amsterdam. Burger-wise, you’d be hard-pressed to beat “Le Cannibale Royale,” a half-pounder burger loaded with sauerkraut, English cheddar cheese, pulled pork, fried onions, and bourbon flavored BBQ sauce. Washed down with their own-brand beer, surrounded by the dark and smoky interior décor, it’s as close to perfection as possible. No reservations, minimal side dishes, barely any seating, and always jam-packed. Lombardo’s ticks all the “best kept secret” boxes. Good-quality burgers and sandwiches are this joint’s sole focus, and the team at Lombardo’s excel at them. Try the Japanese Wagyu beef burger for tender melt-in-the-mouth goodness, or the Spicy Korean Kimchi burger for something more electrifying. And if, God forbid, you’re sick of hamburgers, bite into the “Red Light Reuben” pastrami sandwich for a Dutch take on the New York classic. 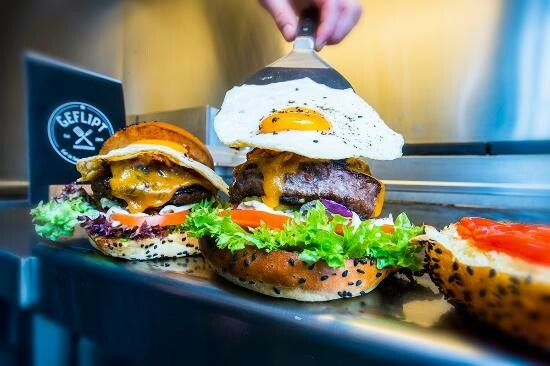 A trendy burger joint in Amsterdam’s trendiest neighborhood, Geflipt talks the talk, but its burgers back up everything. What’s more, the chefs at Geflipt prepare everything in front of you, so you can drool in anticipation while you wait. The menu here hits all the right notes, offering the usual selection of hamburgers, sides, sandwiches and fries. Where Geflipt goes the extra mile is in its home-made sauces, compotes, and chutneys, which complement the meat perfectly. And if you’re feeling lazy, Geflipt also do takeaway and delivery (through Foodora), letting you pig out in the comfort of your own home. 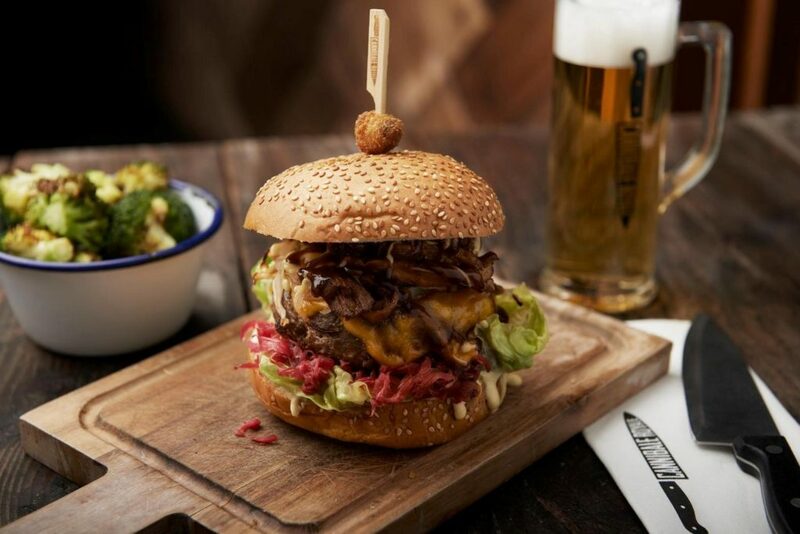 The Beef Chief promises “big fat juicy burgers,” and it certainly doesn’t disappoint. Serving from food trucks around the city, as well as a permanent location at Oedipus Brewery in Noord, the meat here is grilled to perfection, and served with a creative range of toppings on a toasted brioche bun. Like all the best burger joints, the menu is simple. Highlights include the spicy “Kimchief” burger, the American inspired “Patriot,” and the triple-cooked “Redneck Fires” on the side. Since it’s been around, The Beef Chief has won a brace of awards for its hamburgers. Believe the hype and check it out today. Whatever you like on your burger, there’s surely something here to get your mouth watering. And if nothing here does it for you, get in touch and let us know what we missed out on!